I didn't get any painting done yesterday because I had lots of gardening to tend to before the rain set in today. It was such a treat to have the day to play around with my painting and bring more of it to life. It was a bad day to photograph though. Hopefully you can tell from the photo what I've done compared to the previouse posts on this painting. Folk art is so much fun because there are no rules and I can make them up as I go along. All the buildings are close to completion. I just need to decide what each building will be, paint the signs, and add the details inside the windows. The rest is just icing on the cake and oh so much fun! I love the basics of this piece and I can't wait to see all the little details added to it! You are so talented. It does not surprise me that you find this so enjoyable. I think it shows in your work! Thank you for taking us on this journey of building your little villages. I am such a fan! I love this! I love all your art, to be honest, but I'm especially fond of shop fronts and towns/villages. 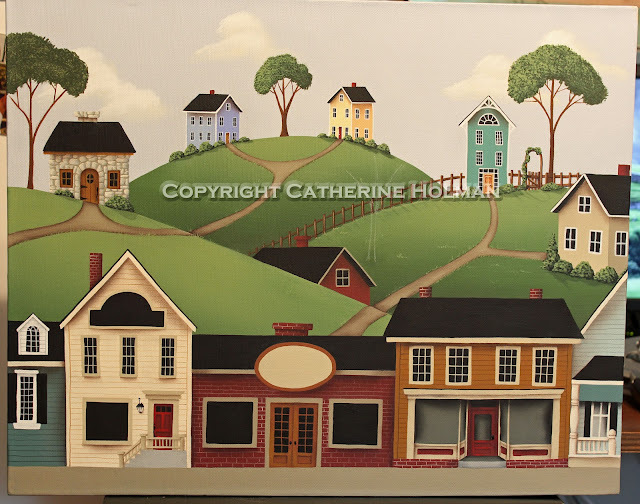 I think that's what attracted me immediately to Charles Wysocki's art - you have that same home-y, friendly, community spirit feeling in many, if not all of your paintings. Can't wait to see all the details added that truly bring it to life and will have me wanting to walk down this lovely street of shops and cafes, and then up the road a bit to either talk in the fresh and crisp mountain air, to my dream home way up in the mountains there. Thanks for sharing this, Catherine. I really think it's wonderful. This is so much fun, watching how you create....thank you for sharing this! Isn´t that the greatest fun, to fill the shops with life? I agree with you, folk art painting is SOOO much fun. It is very liberating and energising. Im enjoying watching your journey with this painting. I like to be taken to gentler worlds. Your painting looks beautiful. I'm sure you will finish it soon and get another photo on a sunny day. I struggle with that here as well, always has to be sunny to get a good photo, which can be very hard. Enjoy finishing your latest work...I'll look forward to see what you name the shops.